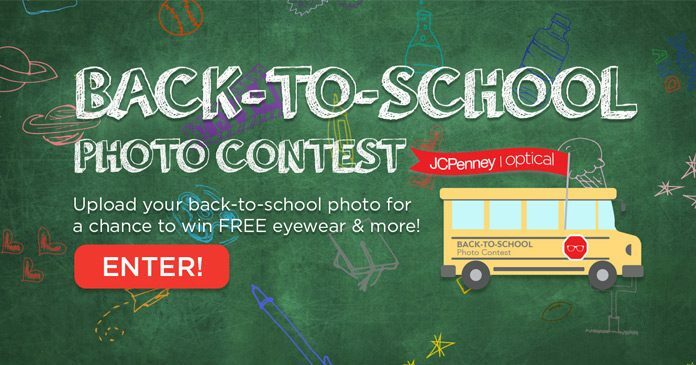 JCPenney Optical Back-To-School Photo Contest: Win FREE Eyewear! This Fall, hit the books with a brand new look, thanks to the JCPenney Optical Back-To-School Photo Contest. Pick your category among Cutest Kid, Best Glasses, Class Clown, Too Cool for School, and Blast from the Past at www.jcpenneyoptical.com/backtoschool and upload your back-to-school photo for a chance to win FREE eyewear and other great eye-catching prizes. Want to know more about the JCPenney Optical Back-To-School Photo Contest? Check out the details below. The Contest is open only to legal residents of the 50 United States and District of Columbia who are 13 years of age or older at the time of entry. Parents or legal guardians may post on behalf of children ages 12 and younger. The Contest Period begins at 12:00 a.m. ET on July 28, 2017 and ends at 11:59 p.m. ET on August 15, 2017. There is a limit of one submission per Entrant/email address for the entire Contest Period. All entries must be submitted by 11:59 p.m. ET on August 15, 2017. On or about August 16, 2017, 50 finalists will be selected by Sponsor from among all eligible entries received during the Contest Period. Each Finalist submission will be posted on the JCPenney Optical Back to School Photo contest website, where the public will be able to vote for their favorite Finalist from August 17, 2017 at 12:00 a.m. ET through August 31, 2017 at 11:59 p.m. ET. The Grand Prize winner will receive a prize based upon the total number of votes received, and subject to verification. Five of the remaining Finalists will be selected by Sponsor as runner-up and will each receive a prize. GRAND PRIZE (1 winner): Two (2) complete pairs of eyeglass frames and lenses from JCPenney Optical and one (1) $100 voucher for JCPenney Portraits. Total approximate retail value (ARV) of $500. RUNNER UP PRIZES (5 winners): One (1) complete pair of eyeglass frames and lenses from JCPenney Optical. Total approximate retail value (ARV) of $200. The total ARV of all Prizes to be awarded is $1,500.00. For the name of the Prize Winners, please submit a self-addressed, stamped envelope to be received by September 30, 2017 to “2017 JCPenney Optical Back to School Photo Contest”, PO Box 10505, Rochester, NY 14610. The Sweepstakes is sponsored by US Vision, Inc. 1 Harmon Drive, Glen Oaks Industrial Park, Glendora, NJ, 08029. For complete details about this JCPenney Sweepstakes, please read the official rules.